Today’s investment recommendation might surprise you. If you’ve been reading the RiskHedge Report, you know the world is changing faster and faster. New industries like crypto have sprung up from nowhere. While iconic American companies like General Electric (GE) have seen their stock prices crater by 60% in the past two years. 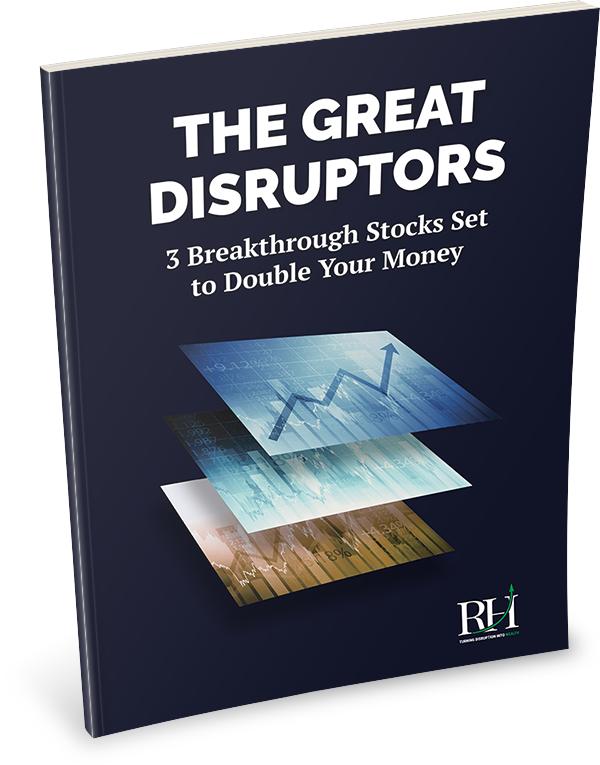 My aim in this letter is to help you profit from disruption. And just as important, avoid being caught on the wrong side of it. Take airplane manufacturing, for example. The established players have an iron grip on the market. It’s all but impossible for others to seriously compete with them. As you might expect, the regulatory hurdles alone are absurdly high. To get a new airplane approved, you have to pass the Federal Aviation Administration's certification process. This takes several years, requires compliance with thousands of regulations, and involves completing about 4,000 documents. Then there’s the cost and time of developing the aircraft. America’s biggest aircraft maker, Boeing, is developing a new plane right now. It’s not projected to take its first flight until 2025… seven years away. Upstart companies just don’t have the money, manpower, or time to seriously threaten the entrenched players. Unlike many of the disruptors I focus on in this letter, these companies won’t typically soar 2x, 3x, or 4x in a short time. Their stocks tend to rise more slowly. But we can still make stacks of cash on them. I call these “get rich slowly” investments. There’s no better example of this than the two firms which dominate aircraft manufacturing: America’s Boeing (BA) and Europe’s Airbus (EADSY). Between them, they control over 95% of the commercial aircraft market. This duopoly makes more than 19 out of every 20 planes in the sky. 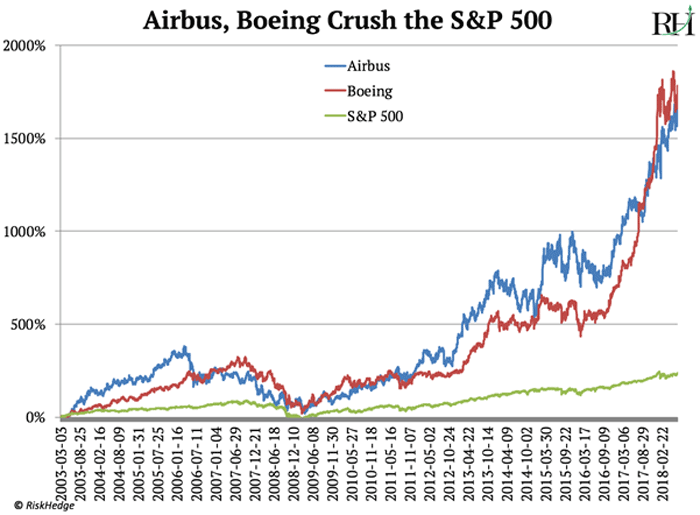 In the last 15 years, Airbus stock has soared 1,735% and Boeing has climbed 1,780%, which crushes the S&P 500’s 240% gain in that time. You can see this outperformance in the below chart. The US slapped a 25% tax on $34 billion worth of Chinese-made goods. China retaliated with the same penalties on US-made goods, including airplanes. You see, airplanes are America’s #1 export to China… totaling $16.3 billion last year. Boeing’s sales to China account for $12 billion of that, which amounts to 13% of the company’s total revenue last year. If China really wants to stick a knife in the US, Boeing is an obvious place to start. And unlike the US where individual companies like JetBlue or American Airlines decide which planes to buy, in China, a central agency is responsible for airplane purchases. That means any company that falls out of favor with Chinese “authorities” is in big trouble. Besides Boeing, Airbus is the only other company that can make the planes China needs… and China needs A LOT of planes. China is about to leap ahead of the US to become the world’s most lucrative airplane market. The International Air Transport Association expects China to surpass America to become the world’s biggest aviation market within three years. This has been a long time coming. In 1996, 17 of the 20 busiest airports were in America or Europe. Today, that number has slipped to eight. And China now claims four spots in the top 20. According to Boeing, China will order $1.1 trillion worth of aircraft in the next two decades. And 25% of new airplane orders worldwide will come from Chinese airlines. Right now, Boeing and Airbus share a 50/50 split of the Chinese market. My prediction is the spat between China and the US is the beginning of something much more damaging and much more global. President Trump is picking trade fights all around the world. He has placed tariffs on imports of timber from Canada. He’s called the European Union a “foe.” All of this tells me we’re entering a new era of protectionism that will hinder trade—especially between big US companies and China. The Asia-Pacific region is already Airbus’s biggest market, with 40% of new orders coming from there. As trade tensions worsen, I expect Chinese airlines will order the majority of the $1.1 trillion in planes they need from Airbus, not Boeing. It has consistently pried away market share from the once dominant Boeing. In 1995, Boeing had an 82% market share of the global airplane market. Today it’s 50/50, and the trend favors Airbus. In 9 of the past 11 years, Airbus has received more orders than Boeing. And here’s an incredible fact. All of these orders have created a backlog for Airbus of around 7,200 aircraft… worth $1.17 trillion. This is the largest backlog of any company in any industry in the world. Boeing’s $490 billion backlog doesn’t come close. Airbus’s gigantic backlog represents about 10 years of deliveries, which allows us to see deep into the company’s future sales. You see, airlines are reluctant to cancel orders they’ve placed with a manufacturer. It’s customary in the industry to put a down payment of 1%–2% up front. If a buyer cancels an order, it loses its down payment. As you can imagine, airplanes aren’t cheap. Even during the financial crisis, cancelations in the industry hit only 3.4%. So even when a recession hits, EADSY should keep earning cash. Airbus delivered 718 aircraft last year, its best year ever. This marked 15 straight years of increasing deliveries. It also achieved its biggest ever profit last year, $3.24 billion. It hit this milestone thanks to rising sales and expanding margins. Airbus’s 4.3% net profit margin was its highest since 2005. 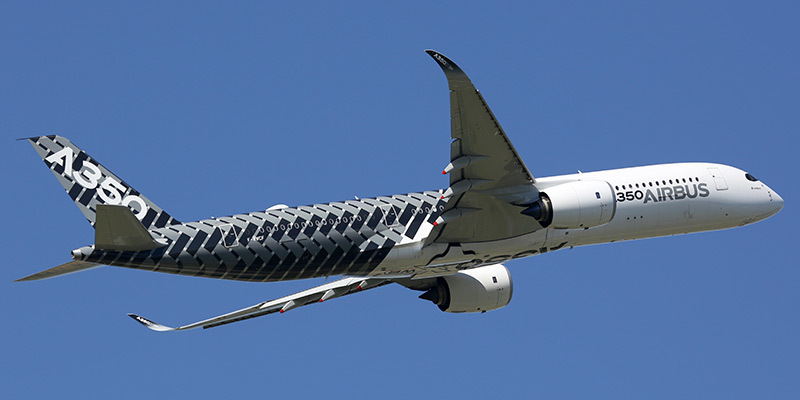 I expect its margins to grow in the coming years as research & development (R&D) costs continue to fall… and production of its newest A350 and A320 aircraft increases. Finally, Airbus has a very healthy cash position of $17.4 billion. It could pay off its debt tomorrow if it wanted to. I’m buying Airbus at $31 today. It’s a long-term, “get rich slowly” holding for me. What are your thoughts on Airbus and the trade war?